Monday night at a bar in Brooklyn my friend Alex and I looked through pictures on his phone of the “early days” of Occupy Wall Street. He had pictures of the General Assembly from Day 5 and we laughed together about how empty it looked, how ramshackle and tenuous almost, how we could still see the pavement and there was still space between the people. 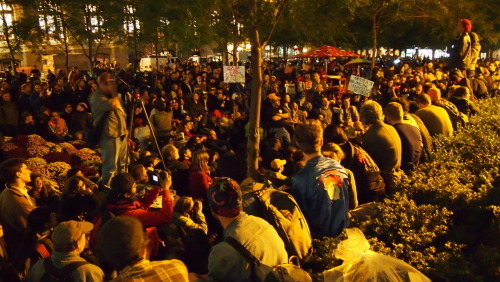 We had just biked back from Occupy Wall Street and we were commenting, again, on how different the space seems every time we are down there. This time I had been surprised to see tents everywhere, something I hadn’t seen before and honestly between the tents, the problems with the drumming in the past week and the debate about moving to a spokes-council structure it felt like the movement was in a moment in which it was trying to deal with its own internal dynamics. Growing pains almost. It makes sense for a movement like Occupy Wall Street to be having growing pains right now. It is still a surprise to most people, those inside the movement and those observing, whether in solidarity or not, that it is still there and that it is growing. It is still a surprise that in places like Occupy Oakland, where their tents were torn down in the middle of the night and they were tear gassed the next evening, they came back the next day in even stronger numbers and called for a general strike. It has become clear in the past month that the political discourse has shifted and it has become clear in the past month that this thing isn’t going away. But some mornings I still wake up surprised about it all.